Better get yourself some Pumpkin Spice Hershey’s Kisses. You’re gonna need them for this recipe! These Pumpkin Spice Pretzel Turtles have only 4 ingredients and are done in minutes! Literally, you only need 3-4 ingredients and about 5 minutes to make this candy. It’s perfect for any occasion – parties, giving away as gifts, hiding in a closet to eat…whatevs. 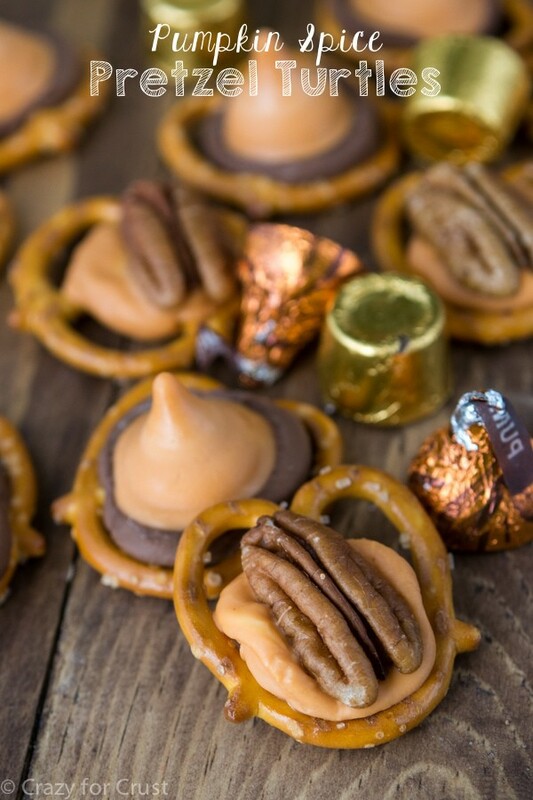 These Pumpkin Spice Pretzel Turtles have only 4 ingredients and are done in minutes! Then preheat your oven to 350°F and line a cookie sheet with parchment paper. Lay out as many pretzels as you want turtles. Place a Rolo on top of some and a Pumpkin Spice Kiss on top of the rest. Bake them for just a few minutes until the outside becomes glossy looking. Seriously, keep an eye on them! It just takes a minute or two. That's it! Let them cool and you have an easy treat for anytime. If you don't like Pumpkin Spice Kisses, you can use ANY flavor! I love turtles and the pretzel element adds even more salty sweet flair! Easy and they look so cute! Those pumpkin spice kisses look crazy addicting!! Love how easy this recipe is! Hi Dorothy, I wanted to share another easy idea using the pretzels at Christmas with kisses/and or rolos and red/green m&ms. They look pretty. I live in Ohio on our family farm. Thank you, I am going to try it soon I have a big event I am doing at church can you send easy quick desserts recipes please? What a cute and tasty idea for snacks or party food! These would be a hit at any fall party! I had no idea there even WERE pumpkin spice Hershey’s kisses! Now I know. Thanks to you.